Is it a dumbbell leg workout a good idea? We are going to find out here. If you’re going to use dumbbells for a workout, you may want to know just how these useful tools came to be referred to by this unusual name. Of course, we’re talking about a free weight that can be used individually or in pairs. Some of the earliest evidence of dumbbell use comes from images dating back five centuries before the birth of Christ. These weights were also used in Greece in ancient athletic games. Historians of exercise, weight-lifting and athletics also show a different type of weight was used, with the name halteres. Some of these were similar in shape to current dumbbells, while others had a single hand-hold that was a hole through the stone. It’s obvious that this type of weight was used as a training tool for centuries, with some Greek athletes holding them as they practiced what is now the long jump. In India, a similar training weight was shaped like a club, so it carried that name through the years. Many of these items were used in pairs during workouts by wrestlers, bodybuilders, and many other athletes. Apparently, the word “dumbbell” was first used about 300 years ago, in England. Dictionaries now describe this training tool as similar to the apparatus used to ring the bell in a church, but without the bell. Thus, the weight was considered a dumb bell. There are several different types, including fixed-weight and adjustable. They are used in many different workout routines e.g. CrossFit. You can use any or all of these types for your dumbbell leg workout. With this simple equipment and the correct technique, you can work on your leg strength and muscle development at home. In fact, there are several excellent plans you can follow, with the individual parts being quite similar from one to the other. Take about one hour for a solid workout then rest for a few days before taking on another leg workout day. There will be pushing, pulling, leg-split and other motions in your program, so be sure you complete quality reps, as many as you can for each set. It’s important to stop your workout when you’re no longer able to stay true to the form described in the instructions. If you move gradually through the process you should be able to add a bit of weight when you want, keeping the quality of your reps up to standards. When you decide to start a regular plan of dumbbell leg exercises you can ask an experienced lifter for guidance on the best leg workout. They’ll probably give you a long list of different movements and positions, but some of these will require specialized equipment and more strength than you have from the start. Some of these can be completed quite comfortably in your home, using two dumbbells (readily available from a local merchant). 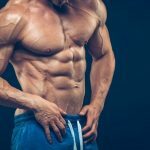 If you start with about six to eight basic exercises and use them consistently, you can build leg strength without paying for a gym membership or even stepping outside the door of your home. The majority of leg workouts with dumbbells begin with squats, which is considered by many to be the best lower-body exercise. It does target all muscles in the upper thigh and the lower back, but it also strengthens hamstring, glutes, and quadriceps (quads). A step-up requires you to use the weight and a step platform, or the bottom step on a set of stairs at your home. You’ll get results with the quadriceps and hamstrings when this exercise is performed using the right technique. Hold the dumbbells at your side and step up one leg at a time. Switch legs and repeat. Again, you should complete eight to 12 reps per leg. Rest a minute and then start on the next set. To properly use dumbbell weight during leg strengthening exercises, hold the dumbbell at the sides of your body, with the hands facing toward the torso. Look straight ahead and keep your back straight while squatting until the thighs are parallel to the floor. Try to keep your knees in line with your toes while slowly rising back to the standing position. This completes your first dumbbell squat. You may find squats are rather challenging if you haven’t pursued any workout program prior to this. Just remember to follow the recommended form to get the proper results. If you try to overwork yourself, you may end up with knee injuries or damage to other parts of your body. In addition, pushing beyond your capability doesn’t deliver results. There is another type of squat, which has its fans and its detractors. The key to success here is being able to keep a solid grip on the weights. If you can master that, this can be a productive dumbbell leg workout. It will probably strain your forearms and wrists because the plan is to hold one dumbbell in front of you. Hold it like you would a goblet, gripping the weighted part with palms upward. Make sure your head is pointed straight forward. Then you just sit back/squat and rise. The next two exercises are called the push press and the lunge. The push press will not only help you build your legs but will also work for almost every muscle group. It can improve your abs and other upper-body muscles for overall fitness. Use lighter dumbbells and hold them at shoulder height, as you would for the military press. The start of the push press is similar to this simple lift. But instead of pressing the weight, you squat down and push to thrust the dumbbells over your head. Lower the dumbbells back to shoulder level and repeat. The back should always be straight and knees kept from extending beyond the toes. A set should contain eight to twelve reps.
You may find this rather challenging, but if you do a bit of stretching and warming up first, it can deliver results. The lunge with dumbbells is a popular lower-body exercise that’s easy for people at all experience levels. Again, use two light dumbbells and hold them at your side with arms fully extended. Step forward, using your back leg to support you. Lunge forward, knees align with your toes, push your body upright. This last motion is completed with quadriceps and glutes. Then switch legs and repeat. Focus on using the correct technique and don’t overextend yourself by using too much weight. This produces better results and reduces the chance of injury. This is probably a good time to discuss the idea of different levels in the world of weight training and exercise. In basic terms, there are three levels, conveniently called beginner, intermediate and advance. 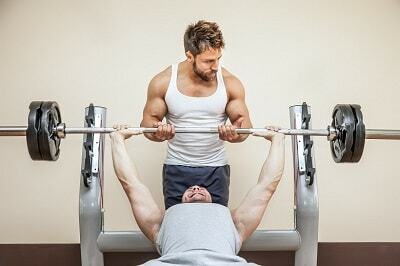 Remember where you are in your program when you try any of the exercises already mentioned. Take a few minutes to get used to the weights first, if you need to, then move to some of the more complicated moves. If you feel you’re beyond the beginner stage and want to take on something a bit more challenging, feel free to do so. But remember to focus on proper technique when you do. If you considered yourself advanced (and you will know it if it’s true) you may want to try some of the more challenging exercises. The deadlift is rather well-known in the powerlifting world. Even the non-lifting population has heard of this one. With dumbbells, you can place them on the ground, bend your legs slightly and, while looking straight in front of you, pick up both weights keeping your back straight. Then lift them to your waist. It’s truly a deadlift. If you’re not comfortable with using two weights at the beginning, start with one, continuing until you’re comfortable enough to try two. This exercise will work the muscles of your lower back, the hamstrings, glutes, and quads. You may want to use this exercise at or near the beginning of your workout. You can also try straight-leg deadlifts with dumbbells. This action will work the glutes and the hamstrings. This involves no knee movement, so more pressure is put on those muscle areas. Remember, this is a more advanced exercise for the lower body. You should probably not attempt this as a beginner. You can also focus on leg workouts for mass as you become more experienced. Perhaps you’ll want to try the hamstring curl, holding the dumbbell between your feet and your body lying flat on a workout bench. This exercise can be done on the floor as well, though this position may be easier using ankle weights. 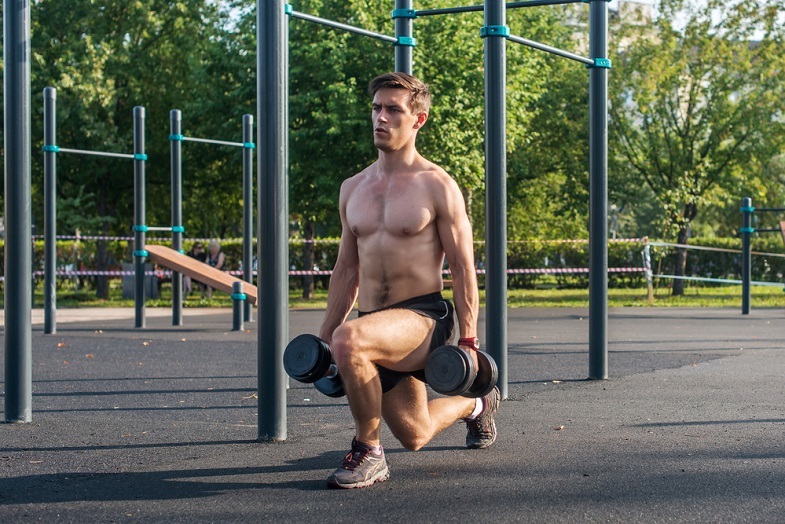 It’s often recommended that you use this in short sets at the end of the lower body workout. Whenever you decide to use the curl, keep the dumbbell weight light and concentrate on making this motion slowly and deliberately. If you need stronger legs and want to have more stamina for your daily life, some quite simple dumbbell leg workout will produce results. Be safe and enjoy.